More than 200 displaced persons from Doda District (home district of Union Health Minister, Shri Ghulam Nabi Azad) resorted to indefinite fast at Jantar Mantar in New Delhi. They were forcibly thrown out of their homes, land and ancestral places by the terrorists during and after the Kargil invasion and have not been provided any relief by the Govt. of India or J&K for the past 12 years in spite of the repeated directions of the Supreme Court of India. Prof. Bhim Singh, Chairman, NPP admired the fasting migrants, mostly women and children from Bhaderwah (village of Shri Ghulam Nabi Azad), Doda, Ramban and other militancy-affected areas who had come all the way to Delhi to ring the alarm on their pathetic and miserable conditions in J&K only because most of them belong to minority and have been made victims of the terrorists with the help of local politicians who belong to ruling National Conference and Congress who intend to cleanse the entire Doda District of a particular community with a particular objective. Addressing the fasting Doda migrants at Jantar Mantar, Prof. Bhim Singh demanded immediate dismissal of NC-Congress alliance Govt. of J&K which has become security risk in the state and deserves immediate dismissal. He accused the Central leadership for playing crutches to the handicapped government of J&K at the cost of the people, particularly the suffering minorities and the migrants. He said that Govt. of J&K has committed contempt of court by deliberately choosing to defy the orders of the Supreme Court in July, 2006 in which Supreme Court has directed the Union & the State Govts. 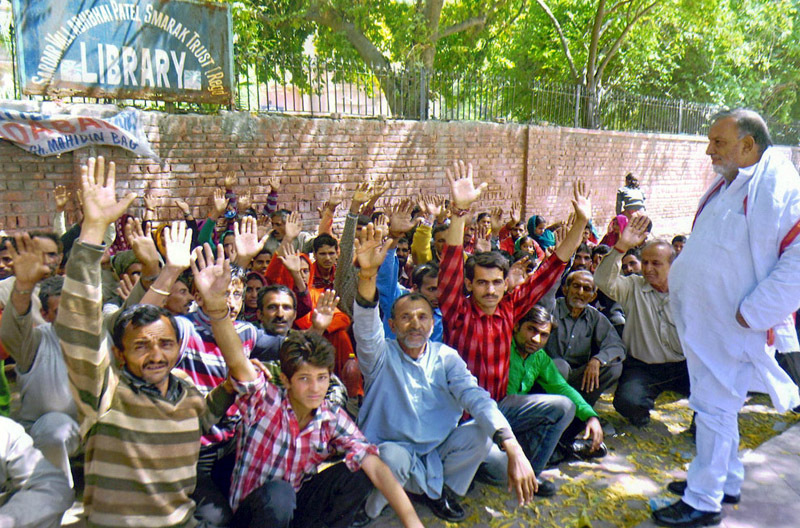 to provide adequate relief and social security to all the migrants who hailed from any part of Jammu Pradesh. A contempt case is already pending before the High Court of J&K for defying the orders of the Supreme Court. The Govt. of J&K had admitted in the Supreme Court that the Govt. owes a sum of Rs.20 crores to the Jammu Migrants as arrears which have not been cleared till date. The Panthers Party Supremo warned the Govt. of India and the Govt. of J&K of serious consequences if these migrants are not given their relief. He said that children of the migrants have been purchased by moneyed persons of Delhi, Mumbai and Kolkatta. The others have become just domestics. No education, no schooling, no recruitment, no jobs, no medical facilities and of course no shelter at all. He held the Governments responsible for violation of human rights of these wretched of the earth, who have been reduced to the status of animals by the government.